The Writer Magazine’s Donna Talarico interviewed me (and the fabulous Allison K. Williams) about Storytelling advice for writers. The article is available in print, in the September 2018 edition. Keystone Edge wrote a nice story about Story Slams in Southeastern Pennsylvania. Read it by clicking here. Matty Dalrymple and I discussed writing on The Indy Author Podcast. Click here. Smith Publicity interviewed me for their podcast on author best practices. Check it out here. Brevity Podcast #7 - Brevity's Allison K. Williams interviewed me and friends about HippoCamp Creative Nonfiction Writers Conference. Check it out here. 999 Words or Less podcast interview covering flash fiction. Coming soon. A nice piece on the winning story from the 2016 Lancaster Story Slam Grand Slam. Click here. Michael Rellahan wrote a beautiful article about Shoplandia and West Chester Story Slam. You can read the article by clicking here. Diane Mastrull wrote this awesome article about StartUp StorySlam events in the city. You can read the article here. Andrea Killany-Thatcher from County Lines Magazine wrote about local authors and the importance of reading local. Read her article here. Thanks to Studio B in Boyertown, the local newspaper promoted my appearance. Erin Negley from Lancaster Online wrote about the the first Lancaster Story Slam season and our upcoming first Grand Slam. Read the article here. Mari Schaefer from the Philadelphia Inquirer wrote this fun piece about the growth of Story Slams in the region, interviewing me and a bunch of friends at West Chester Story Slam. Read the article here. The Morning Call, the newspaper that covers the Lehigh Valley, wrote a feature article about Lehigh Valley Story Slam and its origins. You can read the article here. Interviewed recently for the Shark Tank podcast where we discussed Shoplandia, QVC and what happens behind the scenes in a live television studio. You can listen to the episode by clicking HERE. A nice cover article about the growth of Story Slams. You can read the piece here. 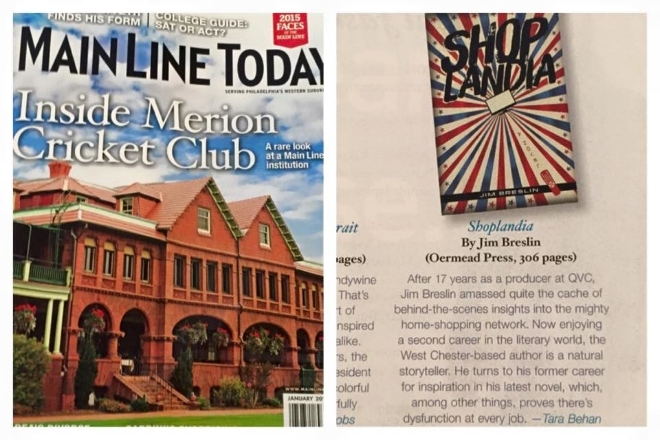 Main Line Today In their January 2015 edition, MLT editor Tara Behan wrote this nice review about Shoplandia. Interviewing Authors Podcast I was interviewed by Tim Knox for his popular Interviewing Authors podcast. You can listen to the podcast by clicking HERE. Fig West Chester Catherine Quillman had some nice words about my writing in this article she wrote about Chester County Book Company's Book Signing Event. Click here to read. Unsung Philly The documentary series Unsung Philly interviewed me about writing, Story Slams, and pursuing my dreams. Huge thanks to Mike Zolomij, the creator of Unsung Philly. Click here. Philadelphia Inquirer Book Review 'Shoplandia': Delightful exploration of the glitzy, manic world of home-shopping TV Reviewer Holly Love wrote a glowing review, ending with this gem: "Despite a smiley-face ending, this novel is worth its weight in all the gold, silver, and crystal jewelry now on clearance prices until midnight. Give me 10,000 copies. I'd gladly give it a go selling them on QVC myself." You can read the full review by clicking HERE. Pop Culture Tonight Patrick Phillips interviewed me about Shoplandia and behind the scenes at a home shopping channel. Pop Culture Tonight is a syndicated radio show which also stores interviews on their website. You can hear the interview by clicking HERE. Huffington Post Books Entertainment Critic Carole Mallory reviewed SHOPLANDIA, calling it a "raucous novel" and exclaiming that Breslin "writes with wit and a terrific eye for snappy revealing dialogue." You can read the full review on Huffington Post Books. Dinner Specials with May Pang and Cynthia Neilson Monday, June 30, 12 Noon Appeared on their radio show to chat about life behind the scenes at QVC and the writing of Shoplandia. Click here to listen. County Lines Magazine ran an article about Shoplandia in their July, 2014 edition. Thanks to Jaimielynn Cooper for the interview. You can read the interview here. Geekadelphia, known as "Philly's Premier geek blog," interviewed me about Shoplandia, Story Slams, and more. You can read the interview here. Thanks to Eric Smith! West Chester Life's Richard Gaw wrote a lengthy piece about how Shoplandia came to be written. You can access a digital copy here. The interview starts on Page 80. Marc Schuster's review of Shoplandia appeared in Shelf Unbound Magazine. You can read the review by clicking HERE. County Lines Magazine placed SHOPLANDIA in the "Good To Know" Section of their June issue. The July issue will feature an interview about the writing of the novel. West Chester Press writer Terry Heyman wrote an awesome feature on West Chester Story Slam for their June issue. Check it out here. Small Press Reviews wrote a really nice review of SHOPLANDIA, saying "it’s the author’s talent for using intimate portraits of his characters to interrogate contemporary values that makes Shoplandia so engaging." You can read the review here. Turk's Head Review wrote a nice review of SHOPLANDIA. Read the review here. Geekadelphia was nice enough to promote my local book launch appearances with this post. Click here. The Home Shopping Queen interviewed me, asking some really good questions about Shoplandia. Read the interview here. Yahoo! 's Alyce Wilson interviewed me about the Top Five Celebrities I met while working as a producer at QVC. You can read the interview here. The Daily Local's Chelsea Reyher wrote a feature article about West Chester Story Slam. To read the article, click here. 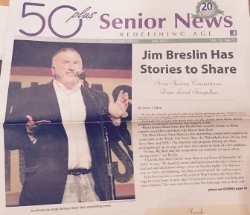 West Chester & Chadds Ford Life recently interviewed me about the West Chester Story Slam. The article can be found in mailboxes throughout the county or online here. The Chester Counting Marketing Group interviewed me on their Google Hangout about the growth of the West Chester Story Slam. To watch the interview, click here. Yahoo News featured West Chester Story Slam and Delco Story Slam in an article about suburban Story Slams. Alyce Wilson interviewed several storytellers for the piece. Check out the article here. Writer Carla Sarett interviewed me about West Chester Story Slam and the new Delco Story Slam. Check out the interview here. David Tomlinson from Zouch Magazine interviewed me about writing. Check out the interview here. County Lines Magazine included Chester County Fiction in their "Good To Know" column. Here's a link to the online version. WHYY's "This I Believe" published my essay about the Twitter community on their website. You can read it here. WHYY’s Newsworks Tonight produced a nice piece about Chester County Fiction that ran on Tuesday, December 20th. David Heller interviewed me about the short story collection, Elephant and the West Chester Story Slam. Listen to the piece at this link. Main Line Today included Chester County Fiction in the "Things We Like" column in their January, 2012 issue. Nicolette Milholin, the Entertainment columnist for the Montgomery News, wrote a nice commentary about the stories in Chester County Fiction and our upcoming appearance at Phoenixville Public Library. To read the article, click here. Nancy Johnson wrote a lengthy and informative piece in West Chester Life about Elephant, Chester County Fiction and the West Chester Story Slam. Click here to read the piece. Misty reviewed the short story collection Elephant on her blog, Kindle Obsessed. In her post, titled "Light readers Need Not Apply," Misty noted "though the writing was good (even impressive in parts)"... the stories in Elephant "were a tad TOO abstract." On October, 21st, appeared on WCHE's Arts and Entertainment show with Steven Brodsky to discuss the book signing of Chester County Fiction at Chester County Book Company. Journalist Catherine Quillman wrote an article for the West Chester Patch about Elephant, Chester County Fiction and the West Chester Story Slam. Click here to read the piece. WCHE's Arts and Entertainment Host Steve Brodsky interviewed me about the Launch of Chester County Fiction, Elephant, and the West Chester Story Slam. Interview took place on September 30th. Fellow writer Evan Wawrzyniak wrote a humorous article in which he interviewed me. You can read the article on West Chester Dish. The article is also running in Chester County Cuisine and Nightlife. Philly writer Michelle Wittle interviewed me about the process of writing short stories for Elephant. The interview is posted at her blog, Inside the Mind of a Writer. Interviewed by Philadelphia Stories Blog about Flash Fiction. June 6th, 2011. Interviewed by David Wisehart of Kindle Author about the short story collection, Elephant. The Amazon Single, We're Not Dog People, was reviewed by Book Brouhaha!